The work-related documents and objects from Curd Jürgens’ estate came into the conservational care of the Deutsches Filmmuseum fifteen years after his death. They are recorded in full in a detailed inventory and are available for further scholarly evaluation. The estate had been preserved in Jürgens’ villa in the South of France until June 1997 and came mostly unsorted into the German Film Museum’s archive. A first sifting of the materials stored in 40 wooden crates confirmed the suspicion that a significant and important collection in film history had been discovered. 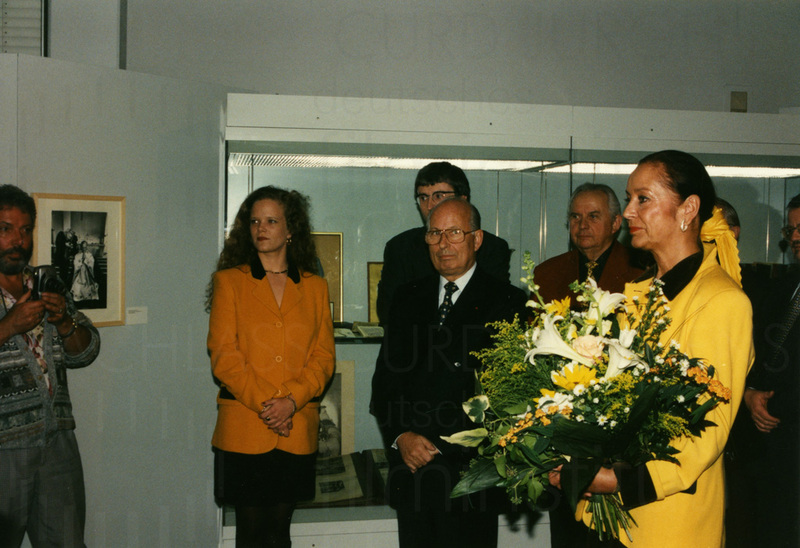 November 1997 saw the official transfer to the museum, linked with a first public presentation of selected items. The full cataloguing and conservation work took over two years. 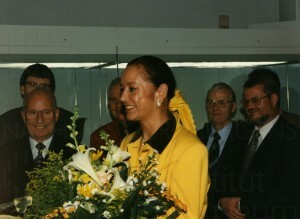 The estate contains the bulk of Curd Jürgens’ papers relating to theatre, film and television. A large-format scrapbook thought to have been started by Jürgens himself in 1935 documents the first ten years of his acting career by means of film and theatre photographs, press cuttings and correspondence. Alongside over 3000 scene and work shots, around 70 scenarios and screenplays, 45 posters, numerous programmes and other work-related records, a collection of correspondence dealing with completed theatre, film and TV work, all his prizes and awards, there is, also preserved in the bequest, a collection of song books and correspondence dealing with projects not completed, all of which offer an insight into the course of the artist’s career. In the estate, is a letter from the director Max Ophüls with information about an (unsuccessful) Jürgens casting for the film LOLA MONTES (1955, D: Max Ophüls). How Jürgens grappled with theatre and film, not only in his acting capacity, is highlighted in an extensive collection of manuscripts and notes containing amongst other things the manuscript to “Geliebter Michael”, a play he wrote in the 1940s, and a manuscript with drafts for film projects which include the synopsis of his first work as director PRÄMIEN AUF DEN TOD (1950). Furthermore, the literary ambitions of the international star are documented in an entry to his autobiography “… und kein bißchen weise” and the publisher’s copy of his 1980 novel “Der süße Duft der Rebellion.” Curd Jürgens, the singer, is also featured in the bequest by way of gramophone recordings, most importantly gramophone recordings of “Schachnovelle” (Stefan Zweig, 1942) and of “Steppenwolf” (Hermann Hesse, 1927). Correspondence with his family, a collection of business records and documents dating from 1946 and a 1947 diary provide information about Curd Jürgens’ life in the immediate post-war years. There are also receipts for food stamps and requests for ration coupons for two pairs of shoes, three suits and three shirts, justified by Jürgens as being indispensable for his work as an actor. Finally, along with the work-related materials there are also personal objects and documents in the bequest. There are over 2300 publicity and personal photographs, diaries and appointment books from 1959 to Jürgens’ death in 1982, a “life mask” from the 1950s, and also personal objects like his pipes and pipe accessories, or a framed picture of a saint – a present from Romy Schneider. Sifting, putting in order, cataloguing and describing – archiving a bequest is also a quest. A great many connections came to light in the course of the work: the evaluation of the substantial press material delivered significant leads; much which had remained hidden for a long time. Photographs, records and private documents reveal new facets, shed light on the star and the private Curd Jürgens from an unusual perspective, in many cases they document what is already known. The materials under discussion, which are presented in this virtual exhibition for the first time online, and so achieving accessibility worldwide, permit a highly personal glimpse into the public and private life of the film star and illustrates the stations of his career. All the materials of the bequest that are presented in this virtual exhibition in digital form can be viewed in our Frankfurt archive.